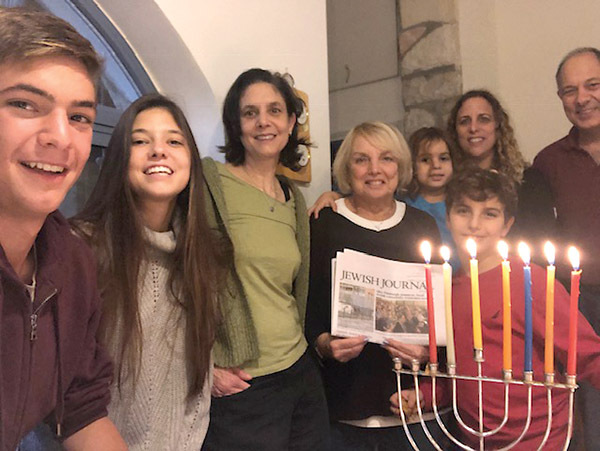 During a recent trip to Israel, Judy Remis (holding Jewish Journal) met with friends and brought along a copy of the Journal. From left, Daniel, Noa and Ayelet Eden with Judy Remis and Idan, Ella and Robin Tveria, and Amir Eden. Ayelet Eden spent the summer of 1987 on the North Shore as a counselor at Camp Simcha. During that summer, Ayelet stayed with Judy Remis and they have been friends ever since.